This one stone royston turquoise bracelet has heavy twist wire and large drops around the stone (1 1/2" by 1 1/8"), set on a 1" wide heavy stamped shank and is a 5 1/4" wrist size. 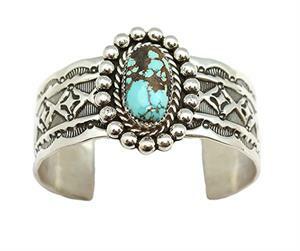 It is made with sterling silver by Navajo artisan Elroy Chavez. **Now only available in #8 turquoise in light green with heavy brown matrix that measures 1 1/8" by 1" wide on a 1" heavy stamped shank and is 5 1/2" wirst size. ***Pictured bracelet has sold and no longer available.